SEMrush is a service for those who like to keep an eye on things. And it makes sense to, because efficiency and rapid response to the emerging issues are of the utmost importance in web analytics. With that in mind, here’s the new Site Audit tool update. Now you can set up a daily site inspection, and receive an email notification anytime we find a new error. Monitoring your site's health just got a lot easier! All you need to do is locate the ‘Schedule’ menu in the tool’s settings. Then select ‘Daily’, and don’t forget to save your changes. 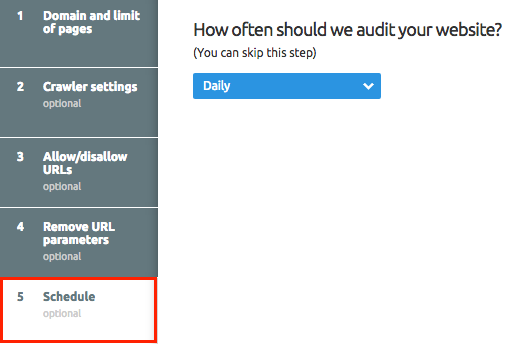 The site monitoring frequency setting will become immediately available when you schedule your first Site Audit campaign using the ‘Schedule’ tab. We’re really looking forward to receiving your feedback. Please send your comments, suggestions and ideas to [email protected].